New Delhi, 19 December 2018: Renowned Bollywood superstar and sports enthusiast Suniel Shetty, cricketing legend Zaheer Khan, and investors extraordinaire Jasmeet Bhatia and Mitesh Sharma, today announced the launch of Ferit Cricket Bash (FCB), India's first nationwide cricket league for amateur cricketers. FCB will feature 16 teams representing various regions of the country. Registration is open to players who are 15+ years, and the best performers will be selected, subject to an intensive 22-city talent search. The league aims to discover the most talented and passionate amateur cricketers from across the country. FCB is an exciting endeavour aimed at encouraging the nation's cricket lovers to pursue their dreams of playing competitively by giving them a massive platform to showcase their talent. After two intense selection rounds involving several thousand aspiring cricketers across multiple cities in India, the final 224 players will be divided into 16 teams. These teams, which will be mentored by internationally renowned cricketing legends and leading coaches from across India, will then compete with each other in an exciting 15-over a side format. Each shortlisted player will receive a participation fee of INR 1 lakh along with exciting cash rewards for the winning teams. The top 14 performers of FCB will be given a once-in-a-lifetime opportunity to represent the FCB All Stars Team and participate in a local club level tournament in Australia. 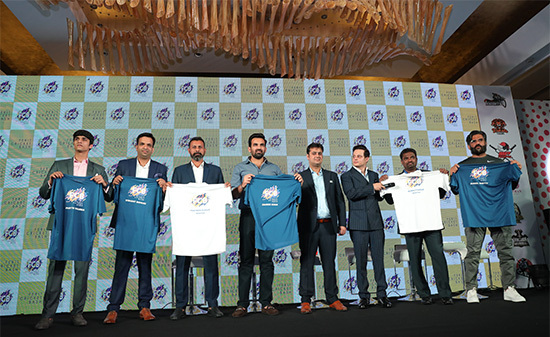 The launch ceremony was hosted by emcee Gaurav Kapoor and graced by some of the most iconic names in cricket such as Zaheer Khan, Muttiah Muralitharan, Chris Gayle, and Praveen Kumar. Industrialists Jasmeet Bhatia and Mitesh Sharma, co-founders and promoters of FCB also stated that a few more international cricketing icons would likely be signed on as mentors for the upcoming season of FCB. Suniel Shetty, co-founder of Ferit Cricket Bash said, "Movies and cricket are two unifying factors in our country, and as a sports enthusiast, I am most excited to launch FCB in partnership with Zaheer, Jasmeet and Mitesh. There is no dearth of passion for cricket in India, and it is almost a religion for us. Even at my age, I look forward to the opportunity of playing a game of cricket regardless of whether it is on a film set or in the lane outside my house. Our endeavour with FCB is to bring young and old 'ziddi's' together on a national scale, and let the cricketing fervour take over. Although FCB is for amateur cricketers, the joy and pride of representing your city or state will push you to go that extra mile, and that is the essence of what we are creating here. Cricket is a way of life for a majority of us, and the most passionate ones deserve the chance to know what it feels like to live the game." Zaheer Khan, Cricket legend and co-founder of FCB said, "I started my journey amongst hundreds of other cricket enthusiasts, and most of us had nothing, but our love for the game that kept us going. It was the opportunities I had while participating in local tournaments back home that later enabled me to represent my country. Therefore, I most definitely realise the value of an opportunity given to amateur players, especially those with humble beginnings. Many passionate cricketers we'll encounter during our search may not aspire to become professional players, but at FCB, it won't stop them from fulfilling their desire of becoming a part of a team, having their names on their jerseys, playing on beautiful grounds across India or having their friends and families rooting for them, while the nation watches. That is the USP of FCB, and I am very proud to be associated with Suniel Anna, Jasmeet and Mitesh. I look forward to encouraging and engaging with India's most talented cricketers." Tavinderjit Singh Panesar, President of DSport Business, the official broadcasting partner of FCB added, "Cricket is India's most cherished sport. The heart and dedication that the country's millions of amateur players show - whether it is in the gullies of Mumbai, or the fields of Punjab - is truly incredible. FCB's idea of supporting these amateur and talented cricket players in such a meaningful and exciting manner is genuinely brilliant, and we are thus elated to associate with stalwarts like Suniel, Zaheer, Jasmeet and Mitesh for this venture. We are certain that the passion these young men display on and off the field will resonate strongly with audiences across India." The Ferit Cricket Bash is going to be conducted in July/August 2019. However, registrations and the following selection process for Phase 1 will begin on 20th December 2018. If you have dreams of glory, and spirit of cricket in your blood, be sure to log on to www.feritcricketbash.com or give a missed call on +91-98710-63063. Ferit Sports India Private Ltd. was founded by Jasmeet Bhatia and Mitesh Sharma with a single objective in mind - to provide people with the once-in-a-lifetime opportunity to play sports competitively. The first season of the tournament is dedicated to the sport which is the lifeline of our country, CRICKET. To take amateur cricket in India to the next level, Jasmeet and Mitesh have partnered with Bollywood superstar, entrepreneur and sports enthusiast Suniel Shetty and cricketing legend Zaheer Khan to launch their first venture, Ferit Cricket Bash (FCB). Ferit Cricket Bash (FCB) is a new and innovative 15-over a side league. It enables amateur cricketers to play the game they love, with the bells and whistles of an international level tournament. A one of a kind Cricket league, FCB is the only platform in India where amateur players get the opportunity to be mentored by International Cricketers like Zaheer Khan, Muttiah Muralitharan, Chris Gayle, and Praveen Kumar. DSport, part of the Discovery Networks Asia Pacific stable is a premium channel catering to a wide range of sports across the globe including Cricket, Football, Rugby, Horse Racing, Cycling, Golf and more. It boasts of an exquisite catalogue of over 4000 hours of live annual content. Exalting Discovery's legacy of two years in India, DSport has enabled access to premier live sports content, especially to the country's gen next.